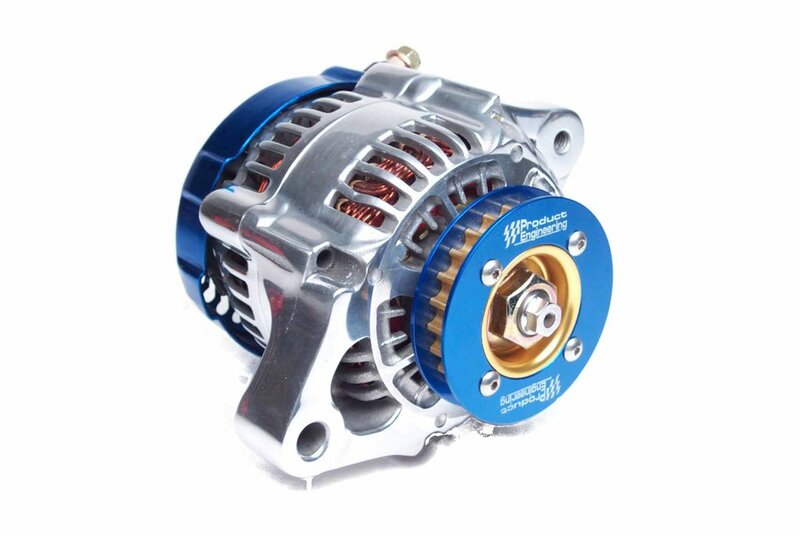 “Designed to cool the biggest engines and intercoolers”; for special applications where engine compartment size and/or cooling requirements dictate the use of remote water pump. Built from the same top notch components as our renowned fuel pumps, it is designed to produce a steady, high volume flow of coolant. 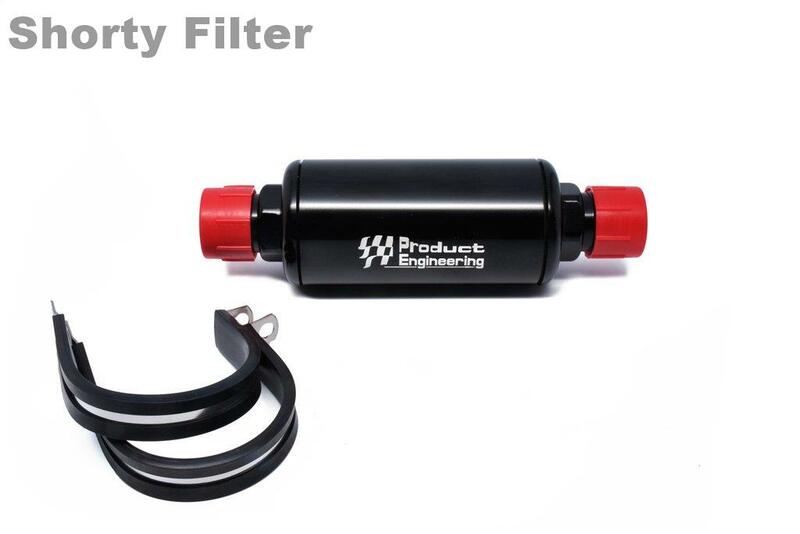 A must for inter-cooled cars using a rear mounted water reservoir. 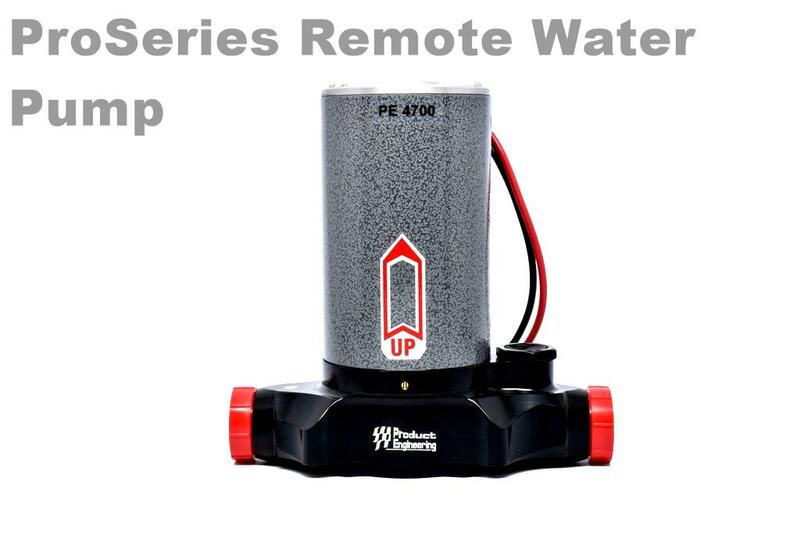 Technical Info & Frequently ask Questions for purchasing a pump or complete fuel system? How much horsepower do I have now? Will I have future growth in horsepower? Is my vehicle a daily driver, a weekend cruiser or strictly a race car? These are some of things that the customer and we at Boteler Racing need to know when considering a fuel system. So; we can work together in providing the most cost effective and best fuel system for your vehicle. Should I use my stock fuel tank or should I modify it by adding a sump? What about a fuel cell? If I use a fuel cell how big and what type should it be? We can assist you in this area. Generally, if its a street car adding a sump would be best. The size of the fuel cell depends on the type of racing and location. Where should I locate the fuel pump? Do I need to locate the fuel pump below the tank or cell for priming purposes? Product Engineering fuel pumps do not need to be located below the fuel tank or cell. Your pump should be located in the trunk and not under the car where it is susceptible to moisture and debris. Are fuel pumps moisture proof? Most after-market electric fuel pumps are not moisture proof. Should the battery be located in close proximity to the fuel pump? Should I start the fuel pump through a relay system? Yes, in both cases. What size should the fuel inlet and outlet lines be? 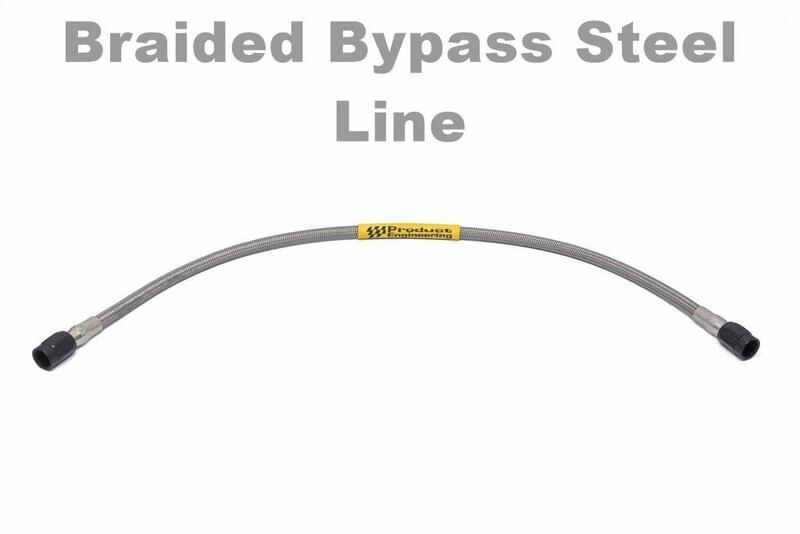 Why do I need a bypass return line from my fuel pump? 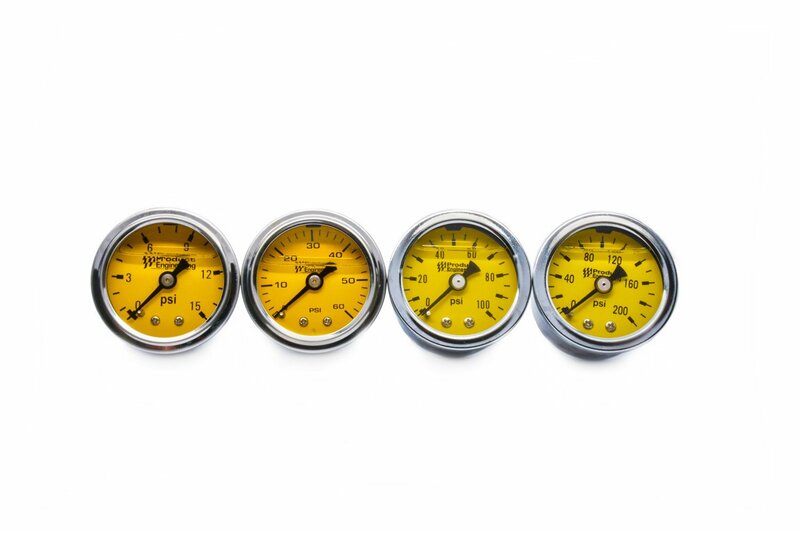 Line sizes are dependent on horsepower and fuel pump size. With the exception of our low pressure PE 4100 fuel pump all Product Engineering fuel pumps require a bypass return to the fuel tank or cell. 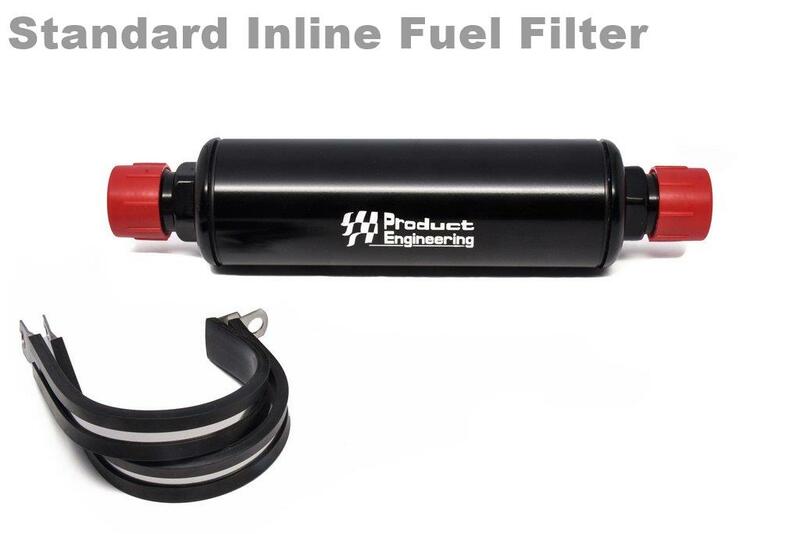 Should my fuel system contain a filter? Yes, and it should be located between the fuel tank or cell and the fuel pump, never after the fuel pump. 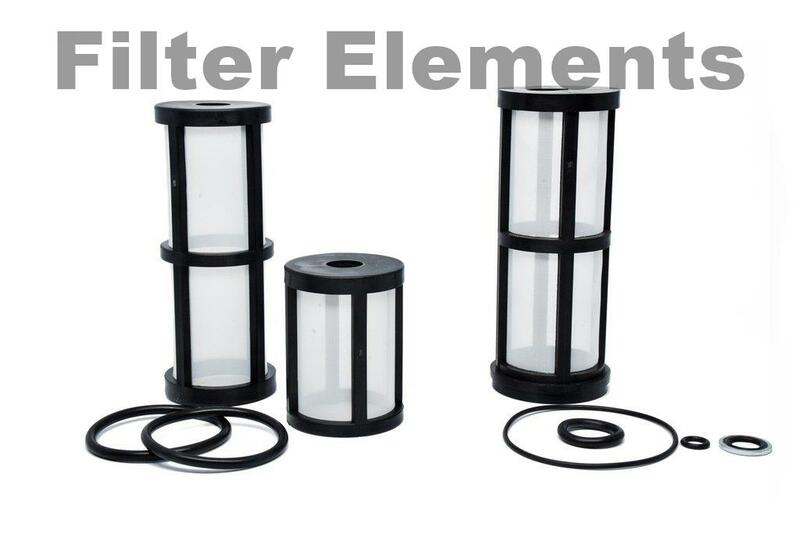 Use a filter with a cleanable element, do not use paper element filters. Where should I locate my fuel regulator? Should it be "soft" or "hard" mounted? All fuel and nitrous regulators should be "soft" mounted and located in front of carburetor and nitrous solenoids. 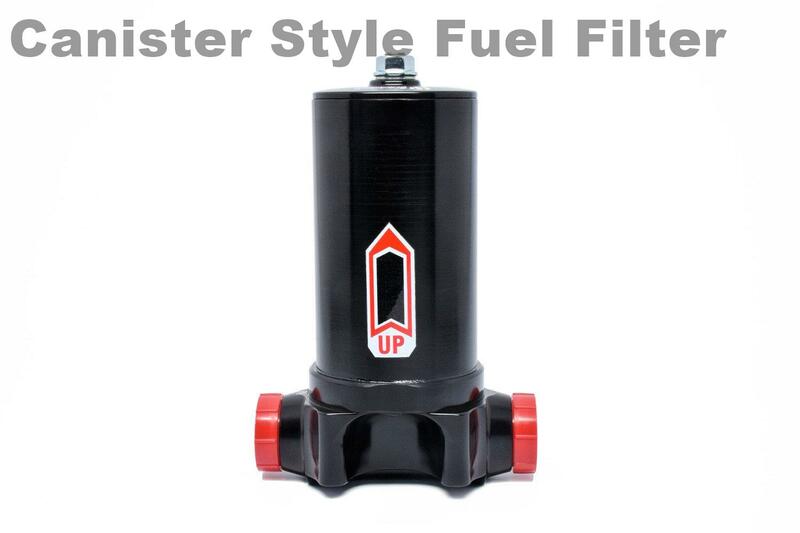 Manufactures fuel pumps, regulators, nitrous fuel systems, racing alternators, anti-reversion plates, fitting, crankshafts mandrels, liquid filled gauges, filters, oil filter adapter, water pumps, and vacuum pumps. 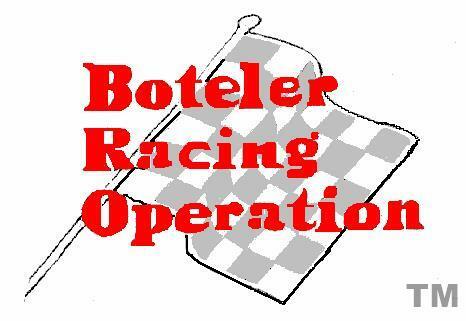 We at Boteler Racing are proud to offer the Product Engineering Brand for Street to Pro-Stock. PE components are the product of choice among racers and automotive enthusiasts who demand quality n' service. 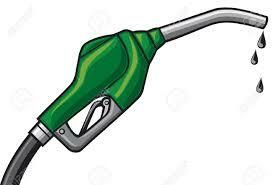 Did you Know: A 10.0 second car needs a fuel pump that will deliver one gallon of fuel through the regulator and to the carburetor in about 20 seconds. An 8.0 second car needs a pump to deliver a gallon in 13-14 seconds. To check your fuel system, all you need is a container 1 1/2 - 2 gallon capacity and a watch. 65 to 85 psi Metering Jets Included. designed exclusively for carburetor blow-through engines. 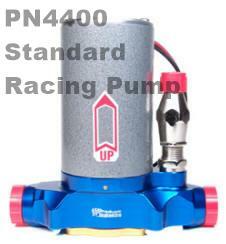 The maximum output pump for carburetor blow-through applications up to 22 PSI Max or 1500 Horsepower. Handle single or twin carburetors! 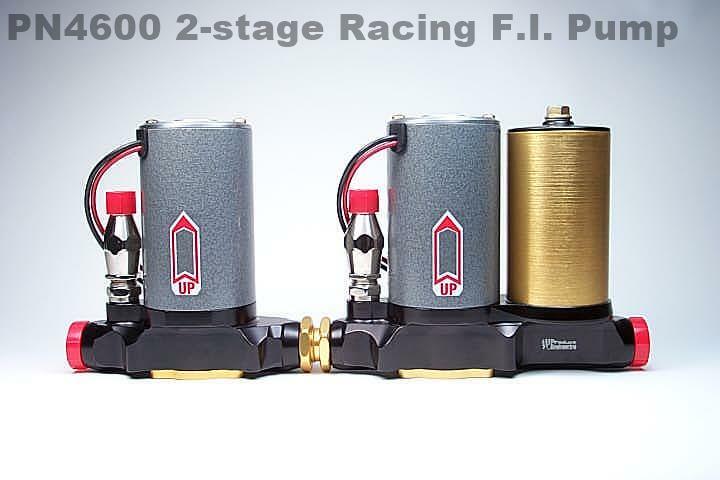 Although referred to as a 'racing fuel pump' this pump as well as all of our others, is perfectly at home on high performance street cars. The custom built, heavy duty 3 " diameter motor is made specifically for continuous duty. Body is CNC machined from 6061-T6 billet aluminum and hard anodized for exceptional wear characteristics. The 7 vane impeller promotes excellent priming and smooth flow. It's cleanable filter is a synthetic mesh screen which free flows 4000 GPH. Traditional colors blue / gold , optional colors: purple / gold , and black/ gold, . Special color combinations are available for a nominal charge. Matching HI-FLO fittings available in blue, black, gold and purple. 1st pump with a 3 ¼ " motor design Twice the torque equals= "Higher" Pressure". 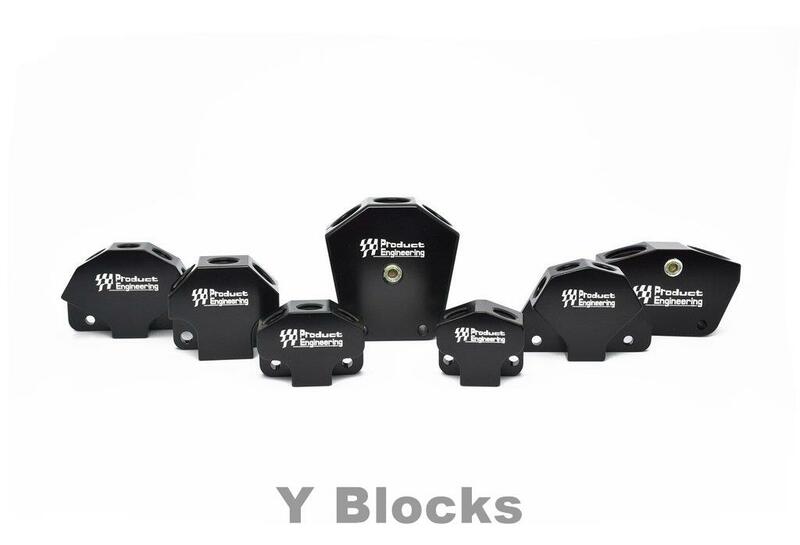 Bypass system available for single through multiple nitrous regulator applications (dual triple and quad regulator set-ups). 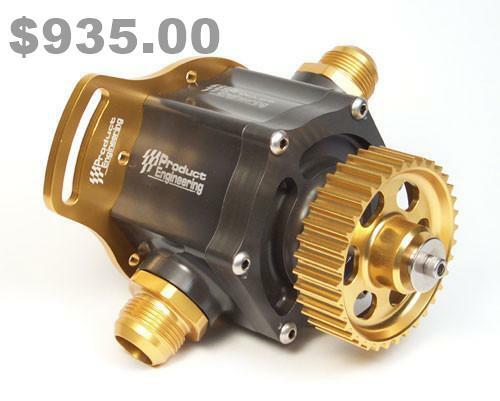 Allows constant flow of fuel throughout the fuel system Maintains carb bowl pressure to within 1/2lb (reduces pressure spiking) Reduces system pulsation. 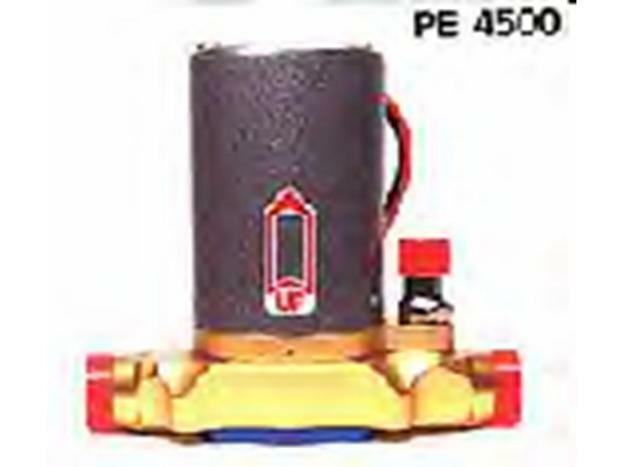 Set pump and regulator pressure without engine running. 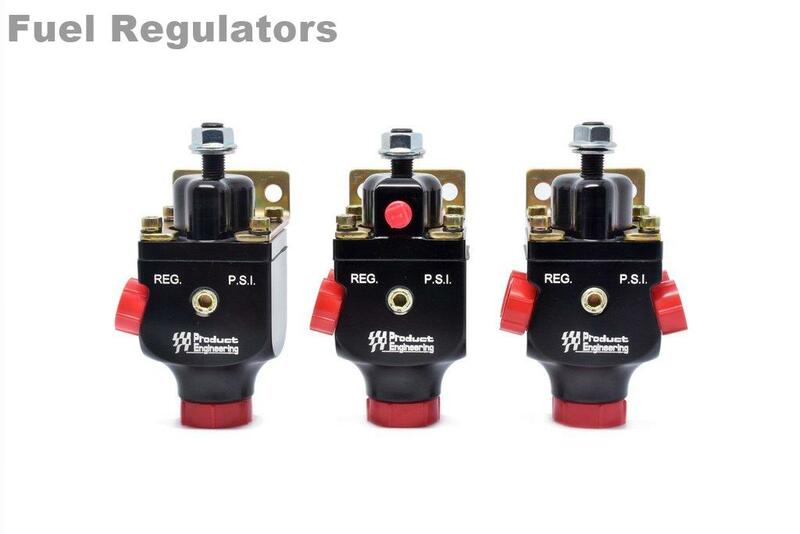 Placement & mounting of fuel and/or nitrous regulators is very important for optimum performance. 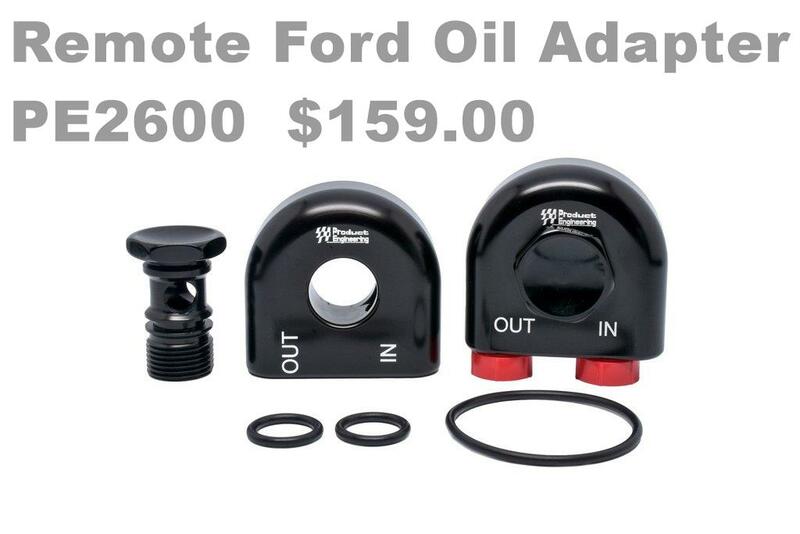 All regulators should be "soft mounted" to isolate them from engine vibration. "Soft mounting" can be accomplished using rubber isolators or simply suspending the regulator from the fuel lines. 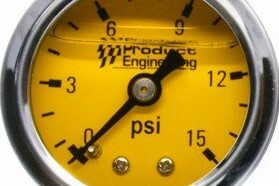 In addition regulators should be mounted in front of or near the front of the engine whenever possible. This location will allow the low pressure fuel flow from the regulator to work with the G- forces when the car is launched. 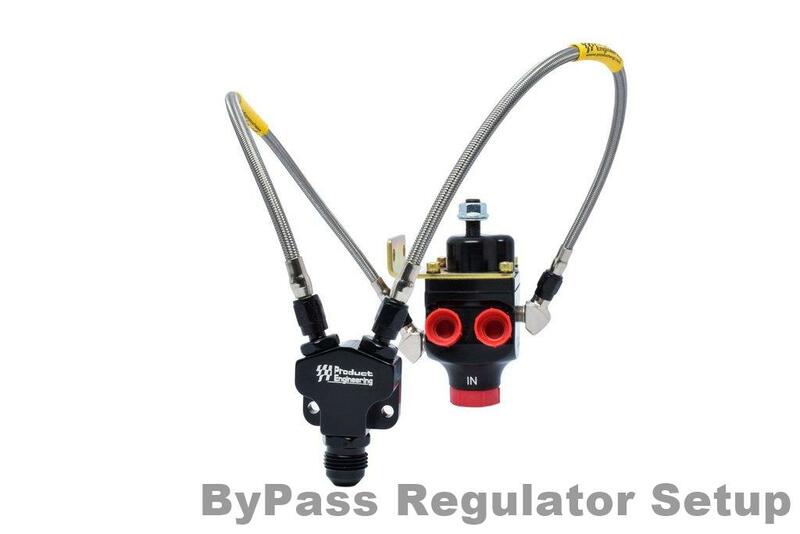 Why use a Regulator Bypass System? It allows for a constant flow of fuel throughout the entire fuel system, making the pump and regulator(s) more responsive to the demands. Help maintain carb bowl pressure to within 1/2 lb. Reduce pressure spiking & system pulsation. Cool fuel is continuously circulated from tank to engine. 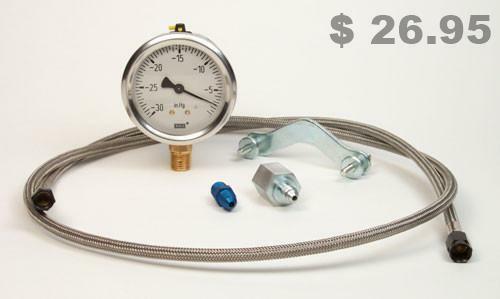 Installing a bypass system enables regulator and fuel pump pressure adjustments while the engine is not running. Envelope dimensions 7.0" x 4.0" x 3.75"